If Ronald Reagan could have heard Rep. Andrew Brenner’s comments about ECOT’s closing, he might have offered up his classic line one more time. “There you go again,” the Gipper might have admonished the Chair of the House Education Committee as he attempted to lay blame anywhere for the online school’s colossal slow-motion train wreck – except where the responsibility really lies in this disaster. No, the Education Committee Chair, who doesn’t know socialism from shinola, has it all wrong. Sometimes, money and where it comes from seems to cloud his judgment. More on that later. It is funny, though, that a Republican like Brenner would even utter the word environment. That word is a radioactive term for the GOP, like the seven words they have banned from use by the Centers of Disease Control. Interestingly, two of the CDC verboten terms include “science-based” and “evidence-based,” and a scientific look at the evidence regarding student performance might also be in order when examining charter school failure in general and ECOT in particular. Two research studies conducted in the last three years provide evidence of what a scientific study of charters in general, and online charters in particular, might reveal. The Center for Research on Education Outcomes, or CREDO, has studied charter schools and found last year that for-profit charters like ECOT “perform markedly worse than their peers in charters managed by nonprofit groups.” If there is anything self-evident about ECOT, it is a for-profit enterprise, where its operating profits supported a largesse that enabled its owner, William Lager, the luxury of purchasing expensive real estate, the ability to donate millions in campaign donations to friendly, mostly-Republican politicians, and a public relations and lobbying effort that kept it afloat for the better part of two decades. In 2015, the Washington Post reported on findings about online schools that were part of another study by CREDO, which is based at Stanford University. • Students in online charters lost an average of about 72 days of learning in reading. • Students in online charters lost 180 days of learning in math during the course of a 180-day school year. Yes, you read that right … it’s as if the students did not attend school at all when it comes to math. It is abundantly clear that the evidence about for-profit and online charters demonstrates that they are not good models to guide educational policy considerations and certainly do not constitute the best choice for educational practice. Far from it. When it comes to basic design and fiscal oversight. the potential for train wrecks with these schools is quite high. But if Brenner is playing the blame game by pointing a finger at the state education agency, he doesn’t need to look any further than Section 3314 of the Ohio Revised Code, where the requirements (or lack thereof) for all types of charters are found. Those requirements are not crafted by ODE, but by pols like Brenner in the Ohio legislature, who are more than happy to take campaign donations from the charter school industry. In looking at online charters like ECOT, the CREDO study also made this telling observation. Current oversight policies in place may not be sufficient for online charter schools. There is evidence that some online charter schools have been able to produce consistent academic benefits for students, but most online charter schools have not. The evidence suggests that online charters don’t serve very well the relatively atypical set of students that currently attend these schools, much less the general population. 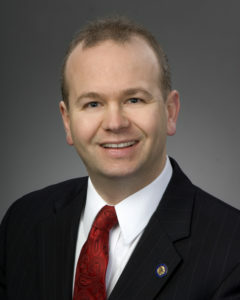 For Brenner and his colleagues, these requirements (or lack thereof, since there are about 150 exemptions from state law) in fact define the environment which Brenner referred to as he tried to shift blame to the state education agency for ECOT’s mid-year implosion, an environment formed by the many legal exemptions given to charters. Some call that environment anything goes. Brenner’s environment is a rather myopic view, where he claims an overbearing ODE forced ECOT to close in mid-year. More accurately, what others less beholden to the charter industry see with ECOT is the behavior of a defiant, politically connected for-profit charter behemoth that gobbles up public funds and expects to bully its way through a much needed, more thorough audit process. As is usually the case with charter schools, inevitably the conversation revolves around deregulation, lack of transparency, having it both ways (take the public money but otherwise ignore everything else expected of a public school), and, of course, money. The department, Brenner said, could have put together a five-year repayment plan for ECOT, instead of two years. Brenner certainly knows that when the subject is charter schools, it’s always about the dollars. And collecting campaign donations. 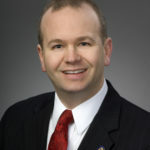 Plunderbund readers, who are quite aware that ECOT’s William Lager is Andrew Brenner’s largest campaign contributor, have a right to be skeptical about anything the House Education Chair has to say on the subject. 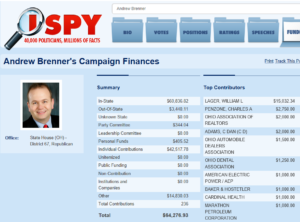 In fact, if a five-year repayment plan were in place for ECOT, a reasonable person could assume that Brenner’s campaign contributions from Lager would continue unabated. 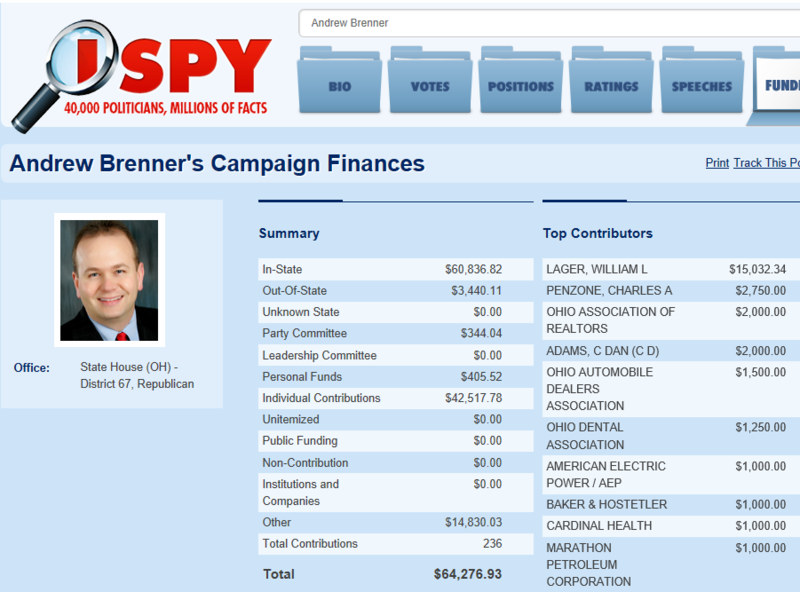 Absent Lager’s help, it appears that Brenner will have to claw for campaign money elsewhere. With Brenner’s word choices in mind, perhaps we should think some more about what meaning we derive from the terms environment and claw. For good measure, and to keep Republicans on their toes, let’s add science, and evidence to the discussion. There is an environment of deregulation and a feeling that anything goes in Ohio. The state needs to totally scrap Section 3314 of the Revised Code and ensure that anything identified as a public school is compatible with full transparency and accountable to the voters whose taxes support public education. At present, charter schools aren’t even public schools and are unconstitutional, according to a ruling by the Washington Supreme Court, as their boards are not chosen by the voters where they operate. State agencies that operate in the public interest, convenience, and necessity are responsible for seeking a settlement from anyone who has overcharged the state or been paid based on fraudulent practices. “There clearly, in this case, are facts that seem on their face to indicate there was misrepresentation, deceit and fraud,” Steven Dettelbach, a candidate for Attorney General, said about the ECOT saga. On the other hand, it’s the politicians who accept campaign contributions, not state agencies performing their duties, that are the ones seen by the public as clawing all the money handed to them. When you observe a subject, gather relevant data, form some hypotheses from your findings and test what you found, there is science involved in the methods used. Moreover, with the number of charter schools operating in Ohio, the amount of scandals involved since their inception, and the number of schools that have closed for a variety of reasons, there is evidence that there is something wrong with how charter schools are designed, authorized, monitored, and operated. In particular, the CREDO scientific study of charters nationally provides strong evidence that the Wild Wild West environment in which they operate is waiting for systemic reform, even abolition, inasmuch as one state has challenged the very constitutional basis of these privately operated but publicly funded schools. Republicans don’t generally like the use of the terms science and evidence, and we’ve seen ample proof of their aversion to language and terminology that use those words. But it might also be fair to say that the public doesn’t like the Wild, Wild West environment in which charter schools operate, and where politicians, clawing for campaign donations, accept anything offered. It was Karl Rove who immortalized the term Fair Game as he took on Democratic opponents during his career. If Democrats can argue that science and an abundance of supporting evidence show that low-performing for-profit charters have created an environment where clawing for money pols are distracted and not performing their legislative duties, then these schools will indeed be fair game. There are elections in ten months and the Olympics begin in ten days. Let the fair games begin.